As summer is on its way and the days get warmer, lighter fresh meals are entering the kitchen. Yet those vegies we typically associate with summer are not quite here. I love the winter flavours with a summer feel that this salad, served for dinner tonight by my friend Rob, embodies. Memories of winter somehow all the more pleasurable because they can be enjoyed from the warmth of spring. Rob is not your typical looking cook, red-haired, you will often find him saw on grain woodworking some design at the back of the house in a cloud of fine dust that settles in his beard and hair, or gazing into space with one of his many instruments saddled in his lap. But Rob keeps surprising me with his kitchen skills and kindly agreed when I asked him to post his recipe… admitting he got it from somewhere else but long enough ago to have forgotten where and changed along the way. You can find his music here where he plays with the lovely Jess Ribeiro and the Bone Collectors. 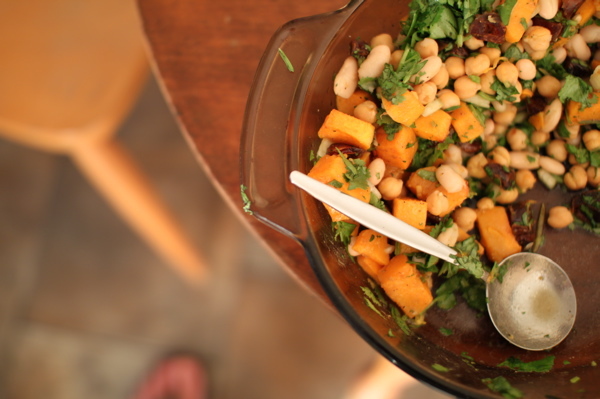 And here is his salad, Chickpea, Pumpkin and Date. Roughly Chop about 1/2 a pumpkin and sprinkle it with 1 tsp ground cumin and 1 tsp ground coriander, drizzle with olive oil and bake in an oven at 180 degrees Celsius for about 1/2 to 3/4 of an hour. Combine in a large bowl with the pumpkin, a cup of roughly chopped dried dates, a handful of chives finely chopped, 2 bunches coriander roughly chopped, juice and rind of one lemon and a good dashing of olive oil. Add salt and pepper to taste and voilà! You are currently viewing the archives for October, 2011 at the invisible cookbook.